It is the distant future, the year TWO THOUSAND.... and one. Robots vs. .. Something in an all out chess battle! UPDATE 06! : FIRST BUILD AVAILABLE!!! Pawn on the alien team are now moveable! Took way too long to figure out, but it's working quite smoothly right now. There's still one bug I need to adjust, which I am hoping to squash tomorrow. Once I get the pawns working properly I'll move on to the other pieces, which should be much easier to do once the logic for actually determining the movement is figured out. UPDATE 02: THE GAME IS SET. MAKE YOUR MOVE ALIEN SCUM. Placeholder while I figure out exact rules, but I want this to be something I can whip up in the time limit and be playable. You play as either robots built by Earth's military or the alien invaders, with one simple goal: Eradicate the opposing forces! Basic chess rules apply. There are 8 pawns, 2 rooks/knights/bishop, 1 king and queen piece. HOWEVER, there will be some more tactical combat implemented. My thought is that these pieces now have designated health, and in order to capture a piece they must engage in a firefight with it. This means, you are not guarunteed the capture, even if you should get it. It also means that a character's move set represents an advantage in winning those firefights. However, because they sustain damage, there is an added level of caution required. 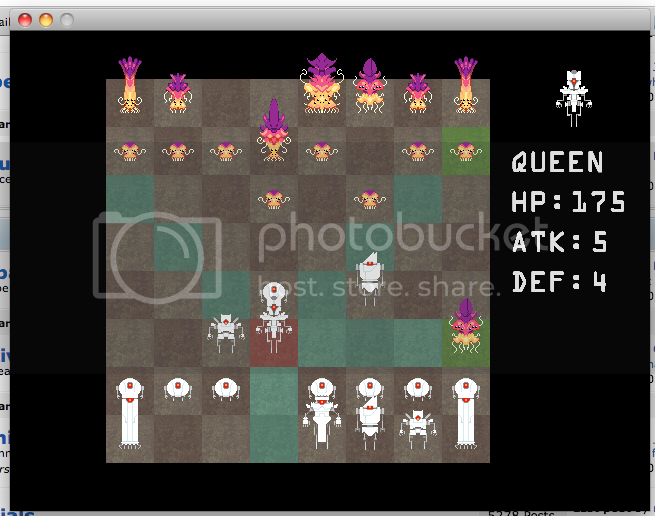 Theoretically, a pawn could get captured by a queen, but still kill it in the ensuing firefight. That's my thought right now. 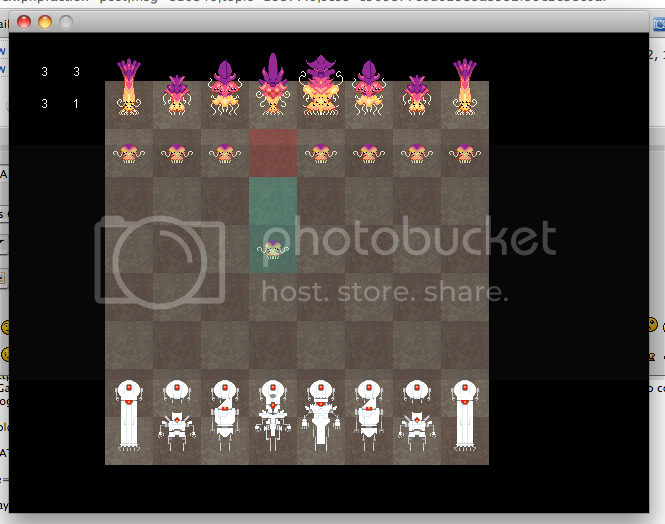 Think advance wars meets chess. Bam. Built by Arc Industries, the PA's are earth's last defence against the alien hordes. These terrifying creatures have come all the way from deep space, and they're hella hungry. What better snack than the human race! MEET THE WHITE TEAM. SENTIENT ROBOTS BUILT BY HUMANS TO COMBAT THE ALIEN INVADERS. great idea and art style. =] Loving your idea. Great art by the way! Think advance wars meets chess. Bam. I just LOVE your art style! The paw is a little misfit though, as all the other robots are square-like. But all of them are great nonetheless! What are your thoughts on the board? A standard 8x8? Or are you mixing thing up a bit? Way ahead of you I'll have those up later tonight, only have the queen left to pixel, and then I'll post em. This sounds absolutely amazing. Totally an intriguing concept. Yoshimitsu: Sure PM me and we can talk about mood/general composition ideas! Meet the evil alien invaders!!! This going to be 2-player or AIed? Local/online? Funnily enough you're not the first tig compo game to make this reference..
Anyways, I like chess, I like robots, art looks good, looking forward to tha game. It doesn't seem to have been pointed out yet, but on that screenshot, the board is only 7x8. Bug or feature? Pure personal folly. I am bad at counting. Also, this'll be strictly local PvP, since I can't program AI very well. Which means you'll have to find a friend to get the most out of this one!